The Japanese gymnast Kohei Uchimura is *very* pretty. Besides that, however, for anyone who is interested and perhaps lost track, I've posted the final Epilogue of The First Day at kurulooke. That is the end of Book 1. It will be a few months before I start Book 2. This gives you some idea of the rather intimidating size of this thing. On the other picture I've drawn is the base that needs to be built on the bottom. It also shows the problems in the corner. I had to remove the baseboard in order to get the bookcase all the way to the wall. Turns out (as I half suspected) that no one had bothered to build a wall behind it. So I had to clean that all up, then add drywall. 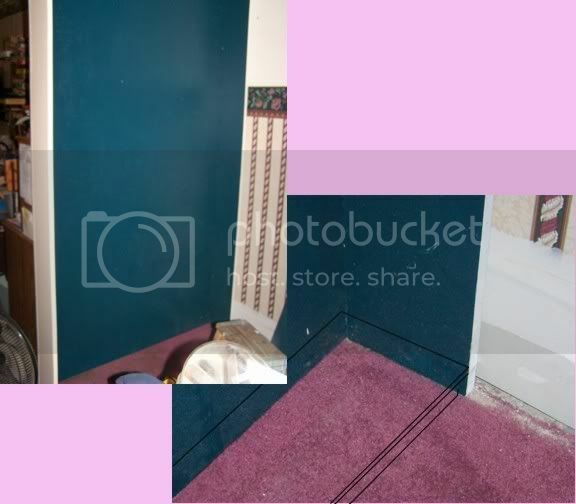 Now, without the baseboard, the carpet (and the full height of the floor underneath) doesn't go all the way to the wall, so I will have to put something solid under that leg.